Time of Origin: Unconfirmed, but definitely far future. Companions: Ben Jackson and Polly. History: Although The Doctor only faced a small group of Schirr, they were easily some of his most ruthless foes. After Earth’s Empire annexed the Schirr planet, a small group of Schirr that came to be known as the Ten-Strong, led by the ruthless DeCaster and his second-in-command, Pallemar, began to mount terrorist assaults on Earth using rituals that they had learned from their former allies, the Morphieans, entities of pure thought; the Morphieans had withdrawn to their quadrant centuries before Earth reached the Schirr planet, but now appeared angered at the humans’ inability to contain the Ten-Strong. Only the best warriors get into Earth's Anti-Terror Elite after exhaustive training, and on every training mission they wear neural net websets to record their experiences and impressions for later review. Right now, a team of ten soldiers, consisting of Marshal Nadina Haunt, her second in command, Shel, Adam Shade, an Earthborn with pieces of a mine in his face following an explosion, his ex Gisel Denni, Joiks, an annoying obnoxious flirt, Mel 'Frog' Nerda, who'd had her throat torn out in a shuttlecrash and could only talk via an artificial microphone, Tovel, a pilot, his old friend and fellow stretcher-bearer Roba, Creben, an intelligence operative, and Lindey, a soldier attempting to blackmail Shade to acquire contacts of her own, were going on a training mission on an abandoned asteroid to destroy two new Kill-Droids. However, once arriving there, Denni went missing, and the TARDIS materialised in a control room where the bodies of DeCaster and his eight followers were standing, apparently dead, behind a force field of some kind while Pallemar was slumped dead in a chair, mysterious stone cherubs being located in various parts of the caverns. After one section of the asteroid took off from the rest, leaving the soldiers and the TARDIS crew trapped with the corpses, it was discovered that Denni was not the only person missing; one of the Schirr corpses had vanished, and some strange effect had sealed the TARDIS doors. Worried about the disappearance, the fact that they were heading into Morphiean space, and by The Doctor's statement that the entire thing seemed very likely to be a trap, Haunt had everyone split off into teams to track down Denni, but Lindey went missing as well, and when they got back, another corpse had vanished. Despite Haunt's claims that the corpses were probably only destroyed by either vibrations from the take-off or the Kill-Droid's disintegrator guns, The Doctor was sceptical about it all - as he had every right to be, since when Ben, Tovel, and Roba managed to take out one Droid and the other was disabled after it attacked The Doctor, Shel and Polly, checks by Creben revealed that the disintegrators hadn't been fired. The situation became increasingly complicated when it was discovered that Shel was an android, sent by Earth Central to join the team for an undisclosed reason, Shel’s organic components breaking down as something about the asteroid began to mutate the team’s flesh. As DeCaster and Pallemar’s bodies vanished, Frog and Shade’s old injuries began to heal in a disturbingly brutal manner; the plastic chunks in Shade's face literally started to push their way out of his skin, and Frog's damaged vocal chords and scarred face were regenerating themselves. However, Frog’s healing was accompanied by her body transforming into a Schirr simultaneously, and Tovel and Roba soon began to experience similar mutations. Finding some pairs of web sets in a room full of crystals that served as the ship’s engines, absorbing flesh as a power source through Schirr rituals, Shade and Frog learned that the newly-discovered websets were Lindey and Shel’s, but Joiks was killed by the stone cherubs, who The Doctor realised were Morphiean constructions. The Doctor also realised that the Schirr bodies were not really dead - they had simply been frozen in Time, and when they had gotten out, they had been moving so fast that nobody could see them as they transferred back into ‘reality’. Examining the websets, they came to the conclusion that Denni was the traitor when Frog’s reports on Shel’s activities revealed that he had been looking for something. When the life support systems were deactivated and only Creben knew enough about the systems to conduct repairs without knowing where they were, The Doctor hardwired the websets so that they transmitted everyone's thoughts to the other websets, in a neural network. While Frog remained in the room with the corpses, the rest of the team went to search the asteroid to conduct repairs, with Polly discovering the navigation crystals needed to steer the ship away from Morphiea while Roba, tapping into the Schirr memories due to his mutation, discovered that Pallemar had become scared by DeCaster's ambition and contacted Earth Central, causing them to send Shel to spy on the asteroid team. When Haunt vanished and Frog was confronted by DeCaster, The Doctor returned to the main chamber ahead of the others, where DeCaster and the revived Ten-Strong were waiting, along with their Morphiean allies… and Haunt, their true inside agent. As it turned out, Haunt had been rescued by the Schirr during a past raid to serve as an inside agent, Haunt driven insane by the terrorism that only affected Earth’s innocents and wanting to create a new war that Earth could actually fight, while the Morphieans actually had no interest in Earth after they ascended to a state of pure consciousness; the attacks on Earth’s empire were carried out by a group of dissidents. With the Schirr weakened by their rituals, they sought to use the team’s bodies to restore their power, the old rule of ten casters for the rituals to work no longer a factor due to the Schirr’s strengthened ties to the Morphieans and the power they would gain from the teams’ bodies. 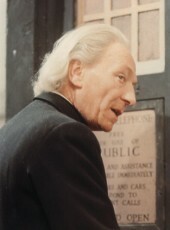 Although The Doctor tried to delay the ritual by mentally holding back a paralysing pulse that would have immobilised the team through the websets, he was too weak at this point in his life - his first regeneration imminent as he began to weaken from old age - to hold them back for long, DeCaster quickly determining what The Doctor was doing and assaulting him to make him allow the pulse to be triggered. As the ritual began, DeCaster consumed Haunt and prepared to absorb the team despite their efforts to turn the ship around with the navigation crystals Polly had discovered, but The Doctor was able to turn the tables on the Schirr at the last minute when he detected Shel in the network, his artificial intelligence having survived the destruction of his physical form. With Shel’s ‘surplus’ soul disrupting the ritual, followed by Roba committing suicide, the ritual’s energies returned to the Schirr with violent results, destroying the remaining Schirr and leaving the Morphiean dissidents exposed and vulnerable to the primary consciousness on their homeworld. With the mutations reversed - although Shade and Frog were still healed from their injuries - The Doctor, Ben, and Polly departed, leaving Tovel, Creben, Frog and Shade to get picked up, all of them changed by the experience, and, The Doctor hoped, now prepared to treat the remaining Schirr with kindness and compassion rather than hatred.